Do your kiddos love Max and Ruby? Do you live within driving distance of Indianapolis, Indiana? If so, then read on for a great giveaway and discount offer on a fun holiday event! Max & Ruby bring to life a wonderful tradition this holiday season as they take to the stage their most magical performance yet! 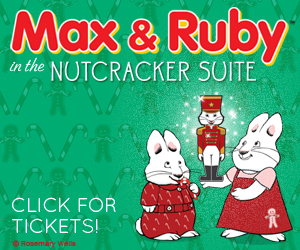 Inspired by one of the greatest musical scores ever composed - Tchaikovsky’s Nutcracker Suite – the beloved bunny siblings star in a brand new musical production Max & Ruby in the Nutcracker Suite. It’s a glistening snowy winter evening and Max & Ruby have been anxiously waiting for the most spectacular event of the year: seeing The Nutcracker ballet with Grandma. Imagine their disappointment when a snow storm keeps them at home! A story of The Nutcracker will have to do! So vivid is Grandma’s storytelling that the characters in the ballet come to life right before their very eyes! Max & Ruby marvel at the sight of many enchanting guests, including a Spanish bullfighter, the Sugar Plum Fairy and the Nutcracker Prince. Ruby is eager to participate in their exquisite dance, but it’s Max who steals the show! Whether it was the sweets, or their lively imaginations, Max & Ruby head off to bed with visions of sugar plums dancing in their heads! Disclosure: I was given a family four pack of tickets to give away to one reader. I was not compensated in any other way. Wow, my girls would love it, but we're not near Indy! Bummer! My younger girls have never been to the theatre, except for musical events. We went to a show today... "If You Give a Mouse a Cookie and Other Stories" at Clowes Hall. We try to go to a few theatre shows a year. The kids love it. Thanks so much for the chance to win! I would love to take my kiddos to this! Jonah loves Max and Ruby! We love going to the theatre! We have the beautiful Paramount theatre here in Anderson.